A stock which i would doubt the fundamentals but the stock saw a super upmove in 2009. Irrespective of market conditions the stock moved from 5 rs to 120 rs non stop. Huge volumes to the tune of 1-4 lakhs daily. 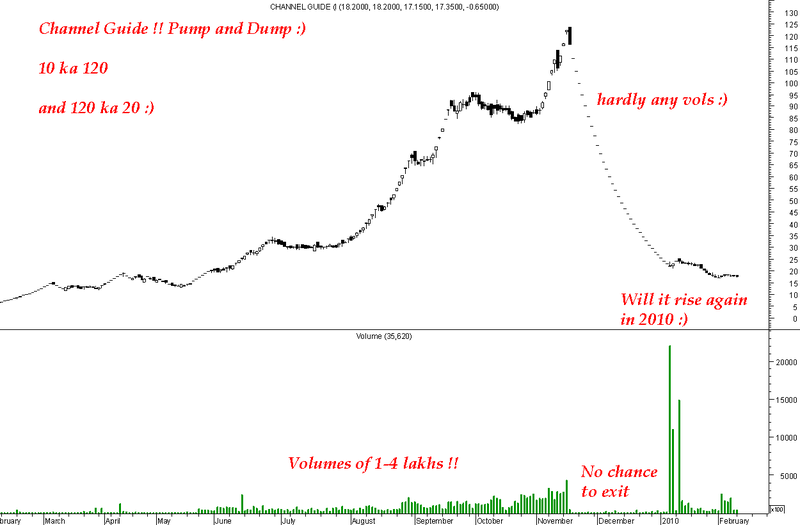 One fine day when the pumping stopped the stock fell like a rock non stop to 20 odd levels. 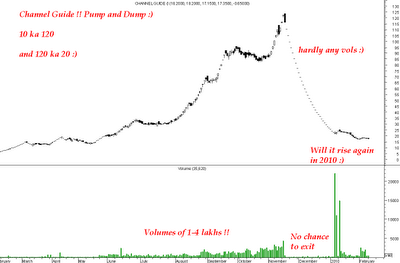 The daily volumes were just around 2k-3k shares in which nobody would have got an exit !!!! Again here i would attribute this to good smart operation which might have screwed some investors. So take care and do adequate research .... Some stocks may be multi-multi baggers and some may kill u. Will continue with more of such market movers in this week.